Ava Kate is such a trooper. Back when she had her bone graft in October, it caused some of her teeth in her mouth the shift. Which is causing her adult teeth to come in all wonky. That's our technical term. We were referred to an orthodontist. Long story short...there isn't much they can do because she doesn't have many adult teeth in her mouth just yet. So they decided to help things along. 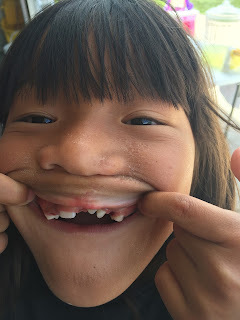 This past Thursday, we visited the dentist for her to get FOUR teeth pulled. She did amazing!!! I was beyond proud of her. I thought she would be in pain after the numbness wore off but she was completely fine. And even had ribs for dinner that night! God Bless this kid. The tooth fairy understood what she went through and felt as though anyone who received 5 shots and had 4 teeth pulled deserved $5 per tooth. Good job, Ava! You are a rockstar! Ava did a great job with the dentist, and it looks like she was really calm throughout the process. Your little girl definitely deserved that money from the tooth fairy. I hope her adult teeth are growing in better now, and not causing any pain or problems in her mouth. I am sure she will be just as brave during her next appointment.